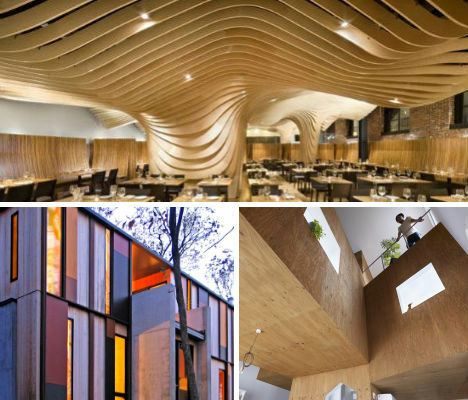 Plywood and other manufactured wood building materials are like the undergarments of architecture – foundational elements that are then covered with a more stylish, finished layer. But their low cost, strong grain, flexibility and the sheer shock of seeing them prominently featured in modern design has given them a more visible role. From kitchen islands finished in humble waferboard to entire houses clad in marine plywood, manufactured wood gives us a glimpse of what it can do in these 13 projects. 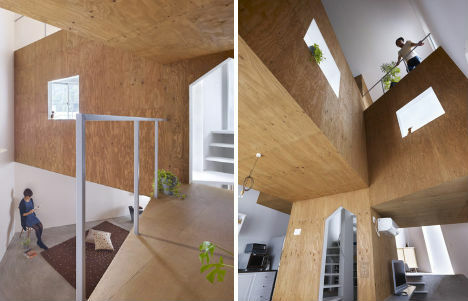 Plywood pops up in this home in Fukawa, Japan in the most unexpected way – as the main material used to create an interior stairway that branches off into various rooms and platforms. Created by Japanese architecture firm Suppose Design Office, the unusual structure is intended to break up a high-ceilinged space, making it appear larger than it actually is. MDF in the ever-changing hues of surrounding deciduous trees makes a stunning contrast with silvery weathered cedar in this Green Lake, Wisconsin house by Johnsen Schmaling Architects. 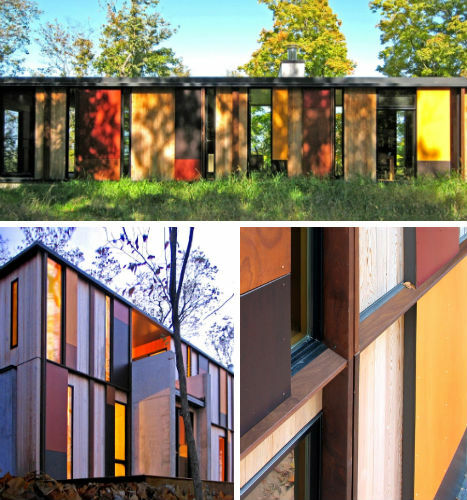 In pursuit of a modern look that blends in with the natural surroundings, the architects chose a low profile and interspersed the colorful MDF, cedar and glass for an effect that mimics the view one gets between trees in a forest. 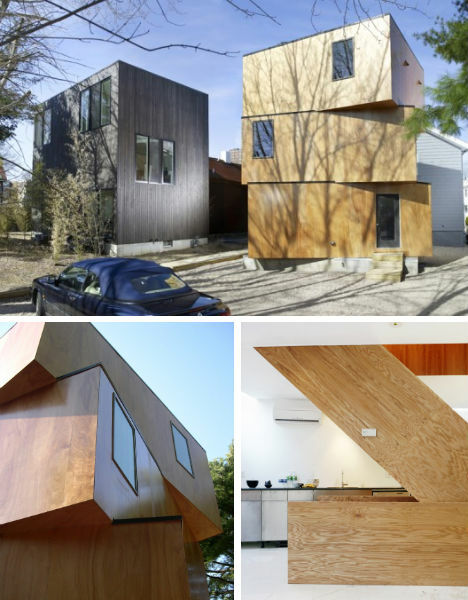 Strong, waterproof marine-grade plywood makes a warm, modern sheath for the XS House in Cambridge, Massachusetts. Architects UNI/Chaewon Kim + Beat Schenk stacked three 16-by-22-foot boxes vertically to get as much use out of a small divided lot as possible. Inside, the plywood theme is continued on the staircase on the first floor, and serves as the main wall covering throughout the second floor. 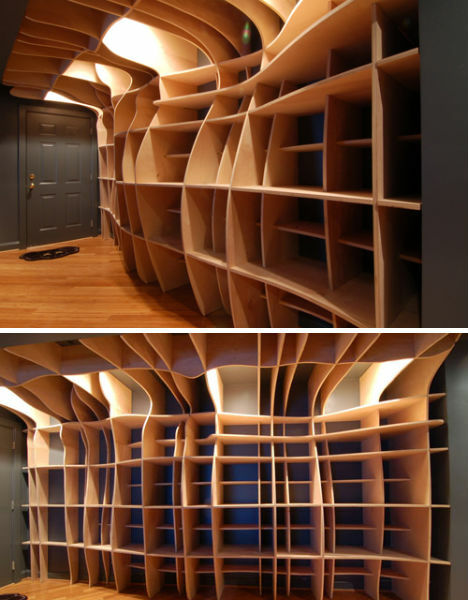 Not many materials bend and flow quite so effortlessly in an application like this fluid free-form bookcase by dbd Studio, which acts as both functional storage and a sculptural art piece in a Washington, D.C. apartment. MDF is an ideal material for digitally fabricated furniture, which is designed and cut using computer programs. Birch plywood was used to completely transform an abandoned space – the former Penny Savings Bank in Boston – into an unforgettable dining space. The design is like an enormous wave undulating from one side of the room to the other, dripping down in columns to the floor. The resulting wood ‘canopy’ hides unsightly elements like mechanical equipment, vents and plumbing. 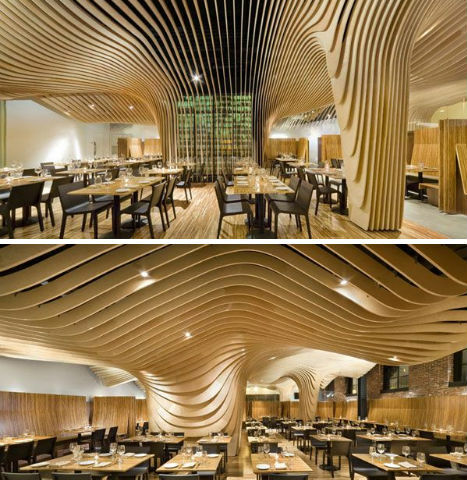 It took 1,000 sheets of plywood to create the 4-foot-thick, 30-foot-long wall that divides the sushi bar from the dining area in Los Angeles’ Nishimura Restaurant. 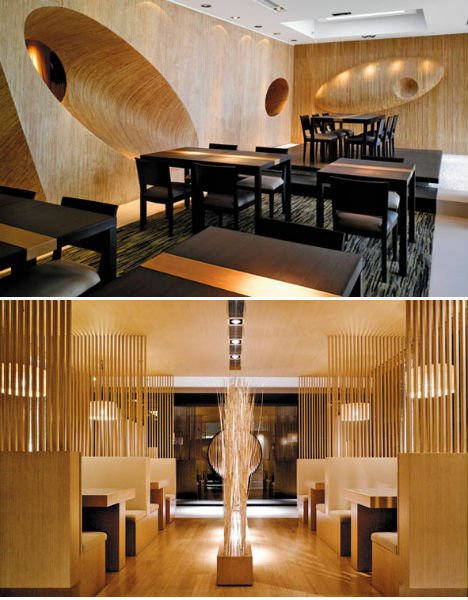 The sheets had to be laminated in place before it was sanded smooth and waxed, and what results is a warm wall that resembles bamboo in its variation of lights and darks. Engineered oak veneers were also used for the booths in the main dining room. 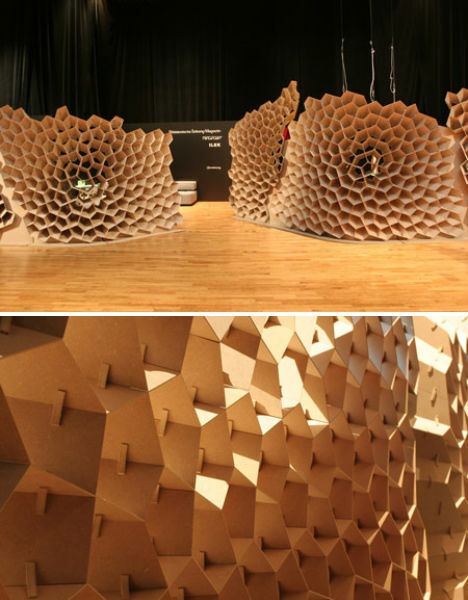 Architecture students at the Institute for Lightweight Structures and Conceptual Design at the University of Stuttgart in Germany created this incredible honeycomb-inspired MDF wall, which acts as a display stand for art exhibitions. Each honeycomb ‘cell’ is uniquely angled to provide a defined focal point, steering the gaze of viewers onto specific objects behind the wall. “Each element of the structure is unique, generated by algorithms based on the location of the wall and the locations of the items exhibited. Once generated, the element shapes were transferred directly to a CNC mill for fabrication,” the students explain. ‘Chic’, ‘Parisian’, ‘Loft’ and ‘Plywood’ – which one of these words doesn’t belong? 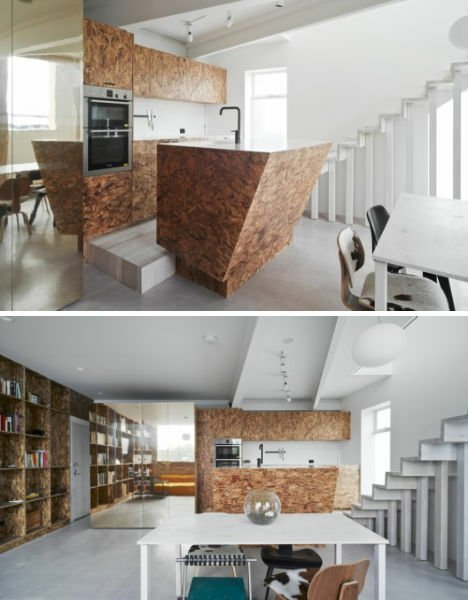 It’s one of the last materials you’d expect to take center stage in a fashionable European apartment, but in this otherwise all-white loft, the grain of plywood panels provides a natural touch of pattern. Made from flakes of wood glued together into a flat planel, waferboard is both strong and cheap, but it’s not pretty – or at least, it’s not often used in ways that cause us to consider its visual value. But it’s certainly not hiding behind paint and drywall in this application, as the exterior surface for kitchen cabinets and an island. For ‘Cubby House’, a renovation of an apartment in Melbourne, Australia, architecture firm Edwards Moore contrasted the rough, tactile surface of waferboard with the smooth uniformity of the walls and floors surrounding it. 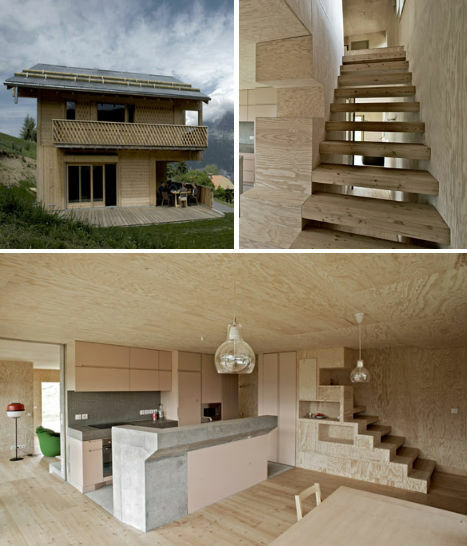 Pale plywood and textural exposed concrete make a strong statement at ‘Chalet Lanel’, a home in France. 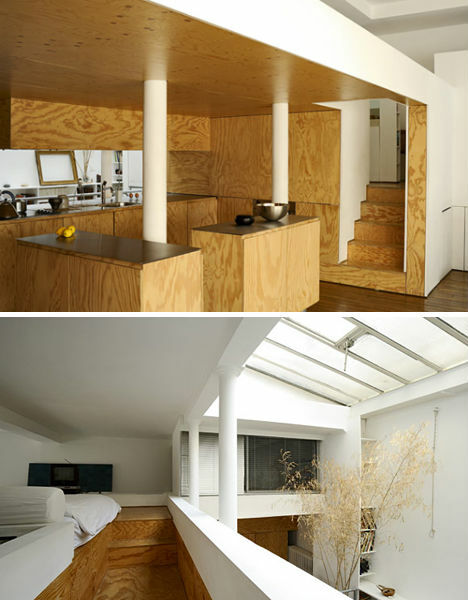 In fact, plywood covers nearly every surface – walls, ceiling, built-in niches – even the bed platform. 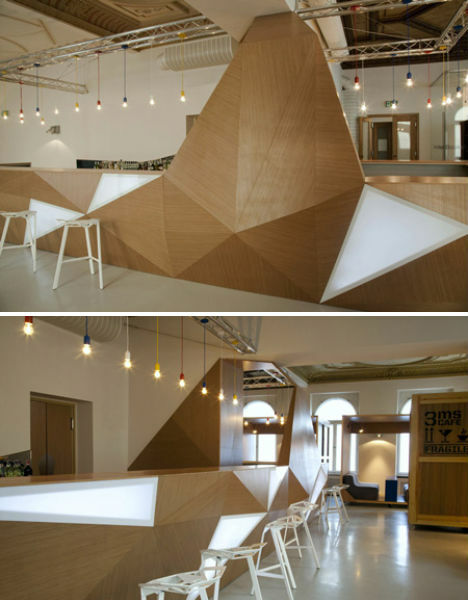 A large faceted plywood bar acts as the centerpiece at MS cafe, located on the ground floor of the Muzeum Sztuki in Lodz, Poland. Design studio Wunderteam wanted to reflect the museum’s avant-garde collection throughout the space, and the bar – made of wooden triangular planes interspersed with back-lit plexiglass panels – is definitely cutting-edge. Most of the architectural and interior designs that have self-consciously included exposed plywood have left it bare, but what kind of impact does it make when painted? 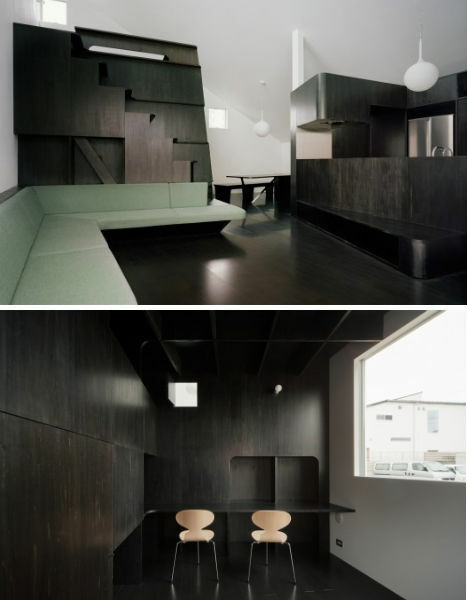 Architecture firm GENETO paints it black in this Tokyo home, aiming for bold built-ins that can be produced economically. Up close, the wood grain can still be seen, preventing the black from overpowering the space. 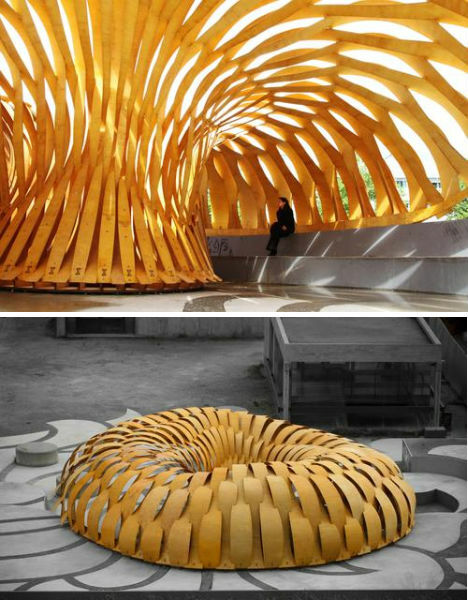 The architectural students at the University of Stuttgart prove that manufactured wood surfaces are good for larger applications as well with this incredible plywood pavilion, located on the university campus. ““The starting point of our deliberations was one of the properties of plywood, the potential of which has not been exploited for structural purposes up until now,” said student Manuel Vollrath. “What I mean by that is its elasticity, resulting from the inherent stresses in the material.” The whole complex process of creating such a structure is laid out at detail.de.